Geostrategically-crucial Syria has been at the center of a decades-long plot by the United States to depose the sovereign government and install one supportive of goals in the Middle East must be revisited — and quickly — before the beating of war drums drowns out the truth of our government’s recently-espoused mission. President Donald Trump has repeatedly castigated President Bashar al-Assad for ordering a gruesome mass killing of civilians with chemical weapons in Khan Sheikhoun. This accusation, unsubstantiated due to lack of investigation, sparked a bolstering of support for the Syrian regime from both Moscow and Tehran. Were the account of an ordered chemical weapons attack to prove unassailably true — and Assad isn’t exactly known for being a gentle despot — Trump could have handily earned a congressional green light and perhaps approval from NATO to obliterate Syrian Arab Army forces responsible. Perhaps. Yet — images of deceased children, women, and men still echoing in shock waves around the planet — the reality show host-turned American President, tellingly, did neither. Fifty-nine $1.87 million Tomahawk missiles raining down on a Syrian air base not long after the ostensive toxic gassing answered with finality whether Trump would fall in line with a succession of pompously bellicose presidents — as well as whether the neocon political establishment’s longstanding mission to forcibly bend Syria to its will. While the preceding bears the names of leaders and nations familiar to current headlines, that assessment, cogently titled, “Bringing Real Muscle to Bear Against Syria,” from former CIA officer Graham Fuller in actuality discusses Syria under Assad’s predecessor — his father, Hafez al-Assad — and is dated September 14, 1983, amid the Iran-Iraq War. — Syrian closure of the Iraqi pipeline has been a key factor in bringing Iraq to its financial knees, impelling it towards dangerous internationalization of the war in the Gulf. With Iraq seeking to enjoin support internationally in the war, the U.S. had to scramble to prevent the shutdown of a pipeline — a dilemma Fuller suggests could be alleviated through a change in narrative to present Syria as a more deviant enemy than even Iran. That, alone, would have changed the face of the war bearing the names of the two principal adversaries — Sunni majority, Iraq, and Syria-allied, Shi’a, Iran. “The US should consider sharply escalating the pressures against Assad [Sr.] through covertly orchestrating simultaneous military threats against Syria from three border states hostile to Syria: Iraq, Israel and Turkey. 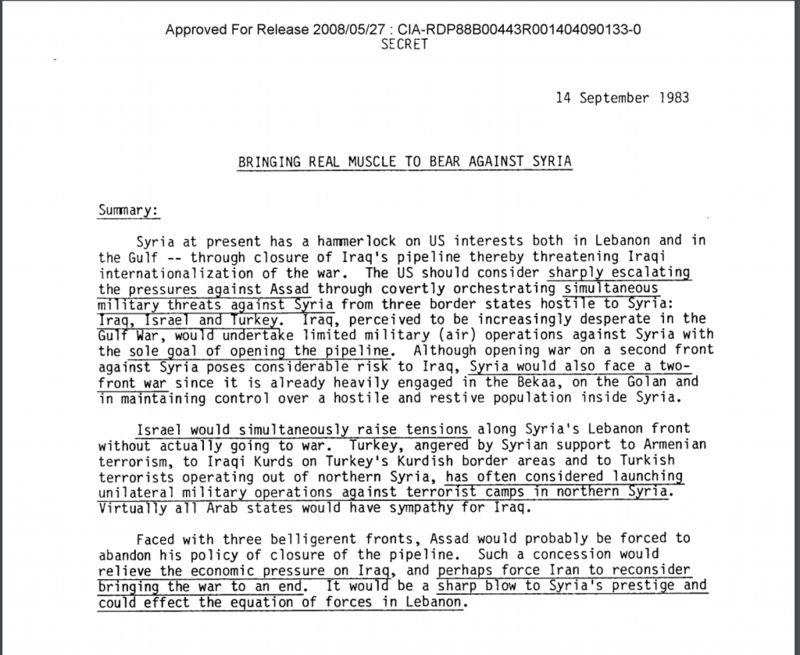 Iraq, perceived to be increasingly desperate in the Gulf war, would undertake limited military (air) operations against Syria with the sole goal of opening the pipeline. Although opening war on a second front against Syria poses considerable risk to Iraq, Syria would also face a two-front war since it is already heavily engaged in the Bekaa, on the Golan and in maintaining control over a hostile and restive population inside Syria. “Israel would simultaneously raise tensions along Syria’s Lebanon front without actually going to war. Turkey, angered by Syrian support to Armenian terrorism, to Iraqi Kurds on Turkey’s Kurdish border areas and to Turkish terrorists operating out of northern Syria, has often considered launching unilateral military operations against terrorist camps in northern Syria. Virtually all Arab states would have sympathy for Iraq. In context, then-President Ronald Reagan faced pressure both to insert military power in Lebanon — a theater of stated neutrality for the U.S. — and to prohibit actual military assistance in the fraught regional entanglement. That is, until a suicide bomber decimated a U.S. Marines barracks encamped at an airport in Beirut, killing hundreds — just one month subsequent to the date on Fuller’s Syria action plan. 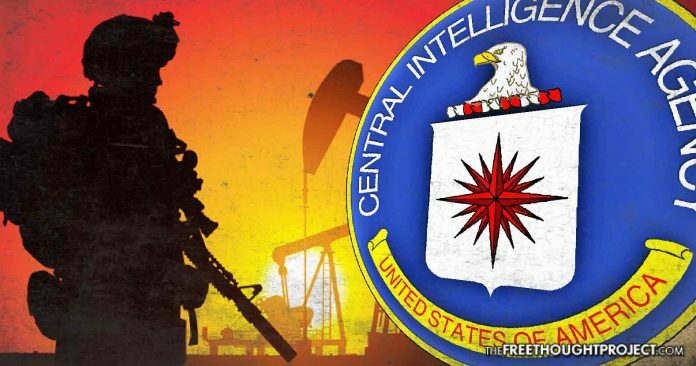 That the CIA — master meddler in the affairs of sovereign nations — determined fault for the bombings rested with Syria and Iran left both plausibly responsible, with public perception largely following suit. That a situation eerily similar — in behind-the-scenes string-pulling and long-term U.S. commitment to deposing an Assad from rule in Syria — appears to be playing out nearly three-and-a-half decades later, bellows resoundingly on failures of interventionist foreign policy. “Such a threat must be primarily military in nature. At present there are three relatively hostile elements around Syria’s borders: Israel, Iraq and Turkey. Consideration must be given to orchestrating a credible military threat against Syria in order to induce at least some moderate change in its policies,” Fuller explained in the document. Syria is now a landmine for the Trump administration — as it has been in varying intensity for a lengthy succession of presidents before. To make proud the neocon warhawks ravenous to rain missiles upon Assad’s forces would duly emblazon the already blood-tinged U.S. government as chief aggressor in a conflict that had been nearing resolution — if not, ultimately, the catalyst for the third world war. In fact, for Trump and his ilk to save face over Syria and prevent the increasing likelihood of direct military conflict with Russia seems an impossibility at this late hour. In only the past week, incessant drums of war reached a frenetic and dizzying pace — met only by furious uproar over yet another theater of war — despite Syria unofficially having been precisely that for the United States for decades.